Where in the world should your business sell? Namdaemun market in Seoul, South Korea. 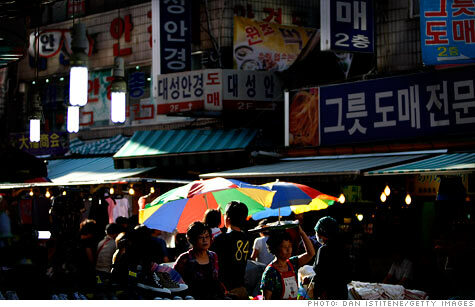 Small exporters can find unexpected opportunity in South Korea, Malaysia and Ghana. (MONEY Magazine) -- With the pro basketball season finally starting, I find myself repeating the scalper's refrain, "Who's buying? Who's selling?" But I'm not thinking about tickets; I'm thinking about business, and small business in particular. The world economy is expected to grow by 4% in 2012. The U.S. and the eurozone will expand at less than half that rate. So, like the scalper, if you've got something to sell, you've got to stand on the corners where the buyers are. If you own a small business, or are in a position of influence in one, that means looking to export to, or expand into, emerging markets. "The consumers are overseas; people need to wake up," says Sandra Westlund-Deenihan, president and design engineer at Quality Float Works. Employing 27, her Schaumburg, Ill., firm makes and distributes metal float balls used to level liquids in industrial settings. The company has had contracts with energy and utility companies in more than a dozen countries over the past decade, and Westlund-Deenihan says the weak dollar makes this a good time to be venturing abroad. But where do you go, exactly? Ernst & Young recently looked at 25 fast-growing markets that offer great opportunities. The usual suspects are there -- Brazil, Russia, India, China, and South Africa -- but their size is an impediment to the little guy: That IBM (IBM, Fortune 500) and McDonald's (MCD, Fortune 500) can set up big operations isn't particularly relevant to an entrepreneur. So I looked at variables that matter to a small exporter, including openness to trade and enforceability of contracts. Then I turned to a World Bank report that ranks countries by how easy it is to start and operate a firm, which gives you some insight into the bureaucratic hoops you'll face. Cross-referencing the two lists, South Korea comes out on top. Westlund-Deenihan recently met with prospects there, as she hopes to take advantage of the new U.S.-Korea free-trade agreement. "I could not believe how expensive everything is," she says. "We look very attractive to them." Second in my algorithm is Malaysia. While income per capita of $7,900 seems low to Americans, it's in the "upper middle" quartile globally. A third country that caught my eye is Ghana. Per capita income is low, but selling to the "aspirational poor" can work for you and them. Ghana's forecasted economic growth rate of 7.3% is close to China's projected 9%. If you want to head overseas, contact your state trade office and the International Trade Administration to see what they know about your product and the markets you're interested in. Various levels of government offer low-cost research help and even discounted trade trips. "If a small company like us can do this, no one has an excuse," says Westlund-Deenihan. "There's plenty of work out there."